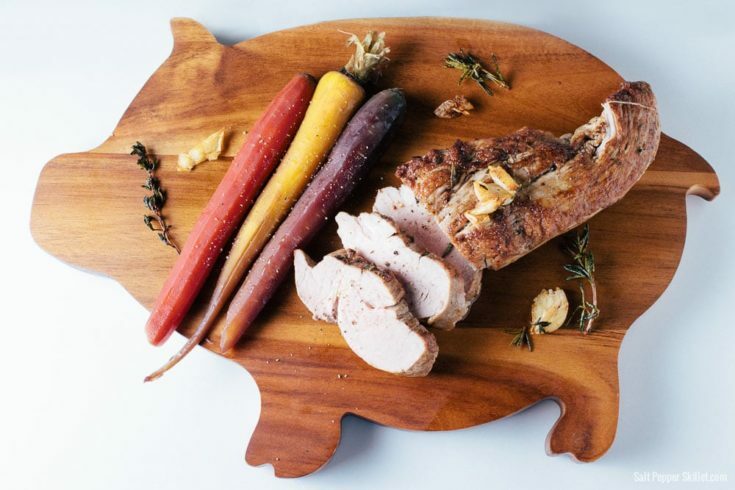 Brined pork tenderloin is one of those dishes that is really hard to mess up because the brine adds moisture and tons of flavor. 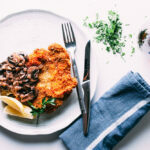 It’s great for quick a dinner for two, or make a few for a luxurious dinner with friends. These small tenderloins cook very quickly. After the brining process is complete; the meat cooks in 30 minutes from hitting the skillet to taking it out of the oven. 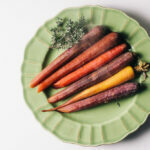 Pair this with some delicious slow-cooked carrots and garlic mashed potatoes. 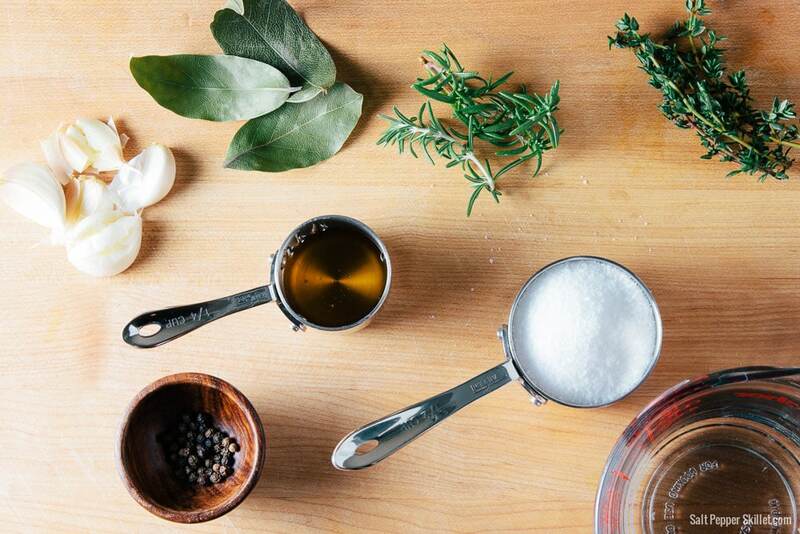 Adding herbs to the brine is a fantastic way to get even more flavor into your pork. Cast iron skillets are my favorite for creating a beautiful sear on meats. Spooning the butter and herbs over the top creates so much awesome flavor. 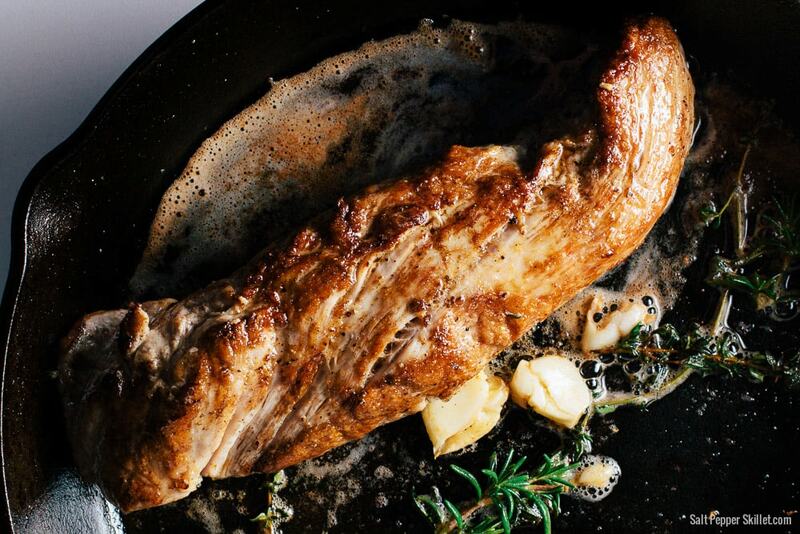 Place the seared tenderloin on a rack in a baking sheet. I like to line the baking sheet with aluminum foil for an easy clean-up. Be sure to rest for at least 15 minutes after you take it out of the oven. This will pull the juices back into the meat so they don’t escape when you slice it. Bring half of the water to a boil with the rest of the ingredients, whisking to dissolve the salt and honey. Transfer the brine to another container big enough to hold the pork and add the remaining water. Cool completely before adding the pork. You can put the container over ice to cool it faster. Place the pork in the brine and refrigerate for 2 to 4 hours. Thoroughly rinse and pat dry with paper towels. Then let the pork sit out for 30 minutes to get to room temp before cooking. Heat the canola oil over medium-high heat in a 10" to 12" skillet. Season the pork with pepper (no need to salt it since it was brined). Sear the pork in the hot skillet cook until it is golden on all sides, about 6 minutes. Reduce the heat and add the butter, garlic cloves, thyme and rosemary to the pan. 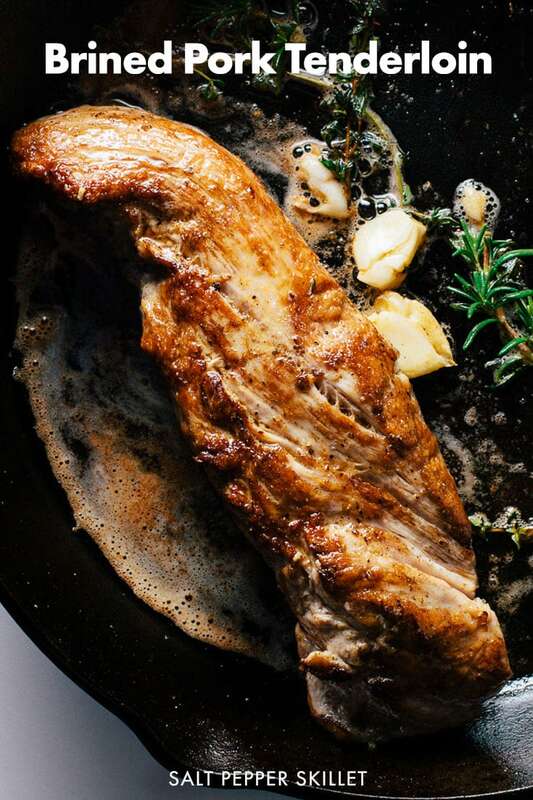 Spoon the melted butter, herbs and pan juices over the pork for another two minutes. 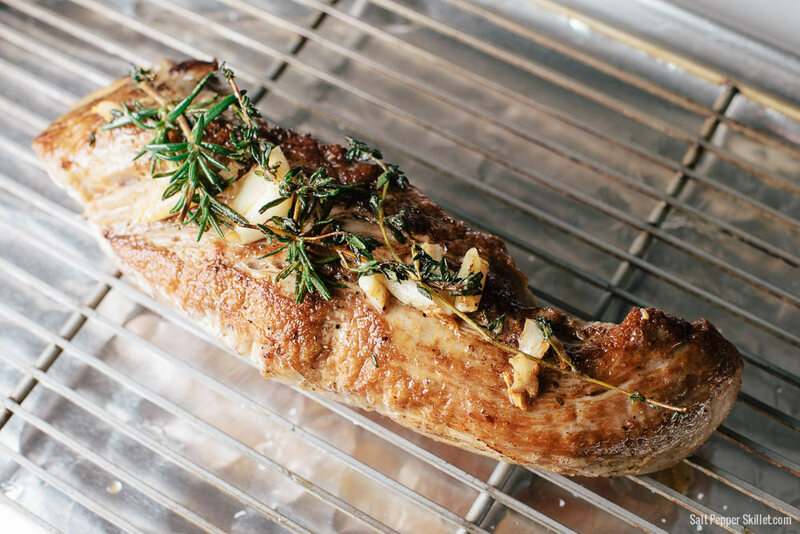 Transfer the pork to a sheet pan with a rack in place, and place the herbs and garlic on top of the pork. Roast for about 20 minutes, or until the pork registers 135-140 degrees. The temperature will continue to rise after the pork is out of the oven. 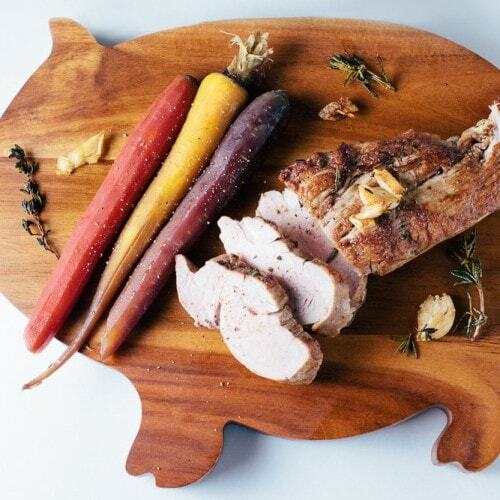 Move to a cutting board, cover with foil and rest for 15 minutes. Wow this looks amazing. Love searing meat with cast iron too. 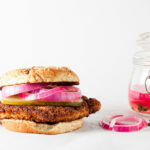 I’ve made this twice now and it’s by far the best pork tenderloin I’ve ever tasted. It’s restaurant quality, or better. I cook the pork right in cast iron pan and don’t bother with the roasting pan and rack. Then while the pork is sitting I make a sauce from maple syrup, whole grain mustard and chicken broth. Just cook long enough to reduce and pour it over the sliced pork. My whole family agrees that this is outstanding. Thanks for posting! I’m so happy to hear that. I totally agree about not needing to put the pork in the roasting pan as I prefer my pork more on the medium side. Thanks for the nice comment. 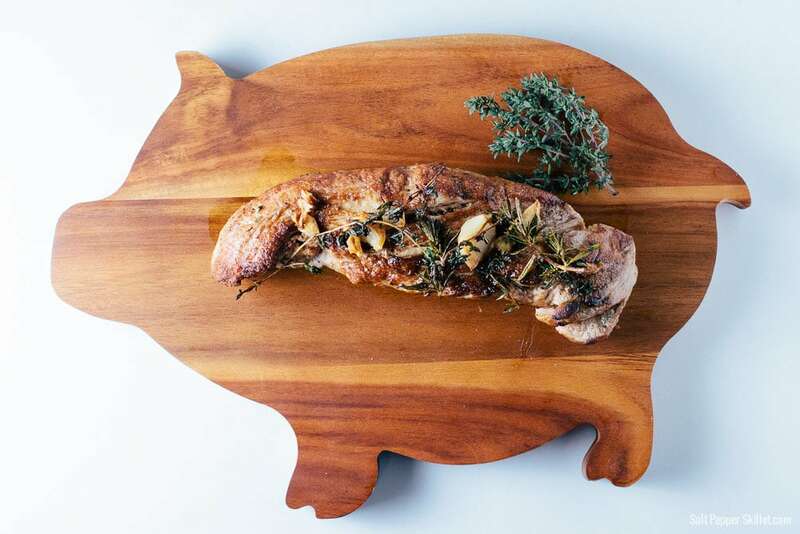 Great recipe, perfect way to bring out the flavor of the pork. Had to make it after seeing that cast iron skillet shot and the butter, nice work on the photos. Great recipe. Very delicious. Only mistake I made was I let the pork sit in brine overnight so the meat was salty. Next time I’ll follow the recipe and only let it sit for 2-4 hours.